The first thing that struck me when we walked in was how different the restaurant interior was from its unassuming, slightly fusty exterior. The setting is modern, complete with a backlit bar and artsy black-and-white framed photographs of India. And the clientele cuts a wide swath, including young families and posses of Edinburgh’s fashion forward. 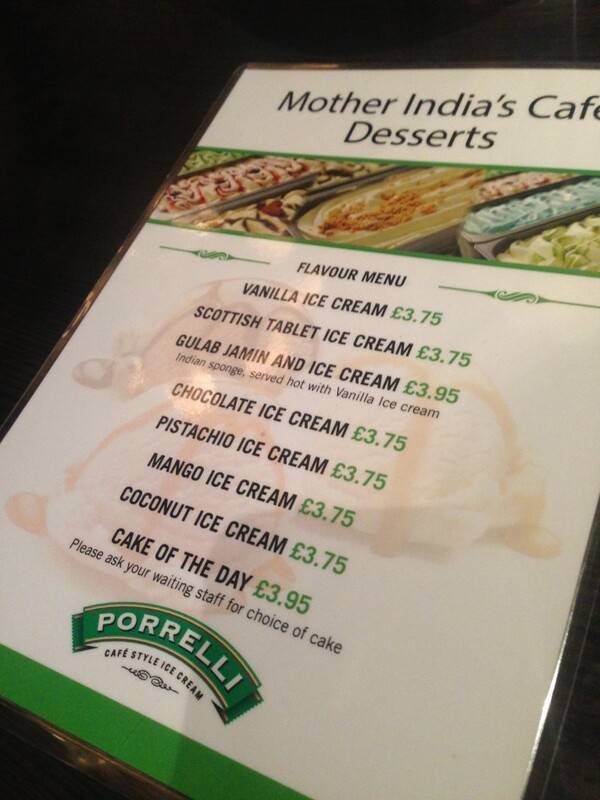 Mother India’s Cafe is part of a small chain of Indian restaurants in Scotland — the mothership (just named Mother India) opened in 1996 in Glasgow, where there’s now also a cafe and deli. 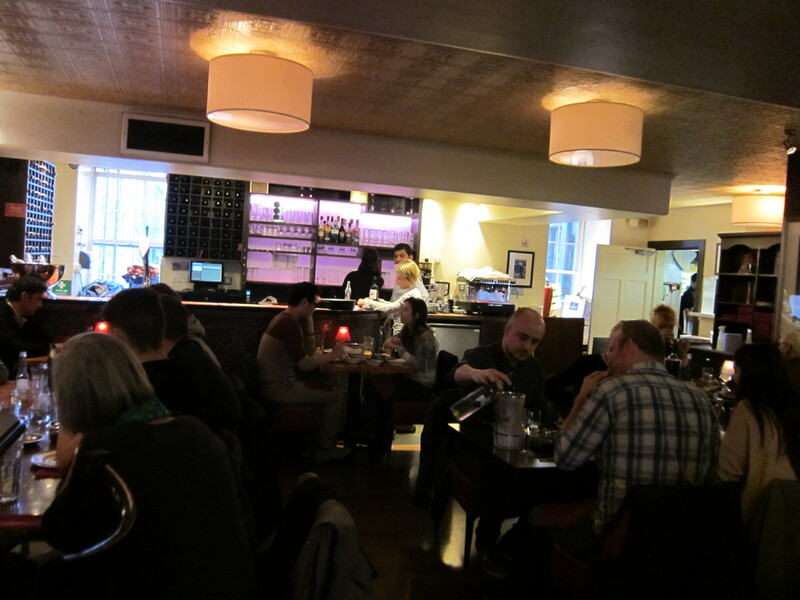 The one in Edinburgh opened in 2008 and features tapas style Indian dishes. 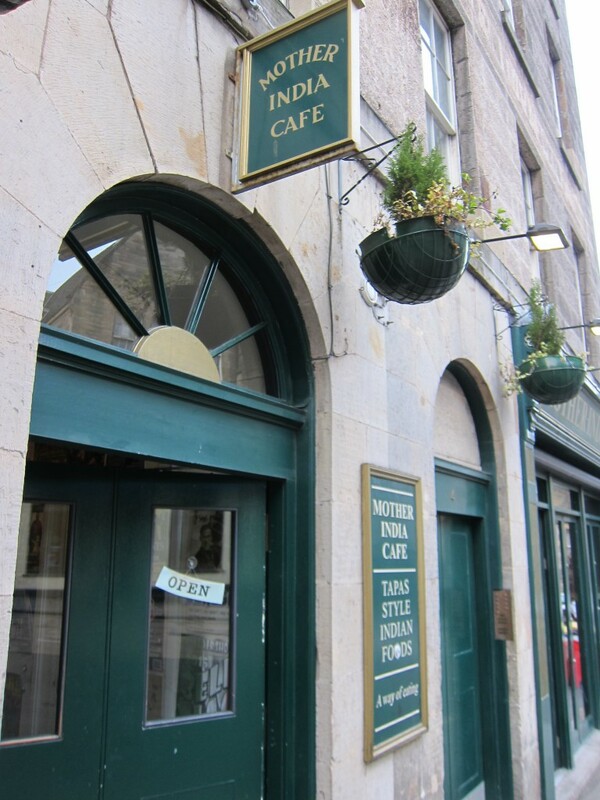 After such a miserable day of blustery weather — otherwise known as “spring” in Scotland — we were starving. 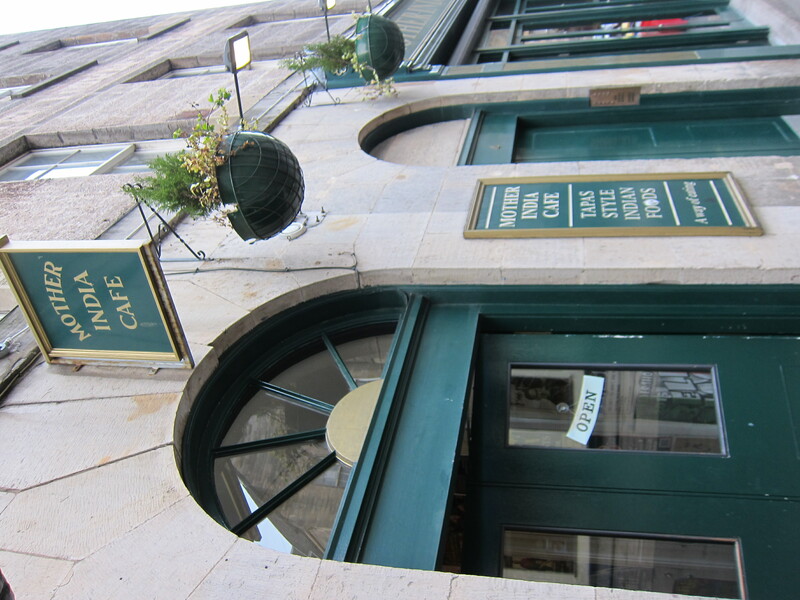 D.B., who thankfully shares my love for spice and garlic to the extreme, immediately voted for the chilli fish cakes (£4.95), which were small deep-fried, breaded patties of fresh fish blended with green chilli, ginger, potatoes, garlic and onions. I loved how crisp and nicely fried they were and the patties themselves, though milder than I’d hoped, were tasty. 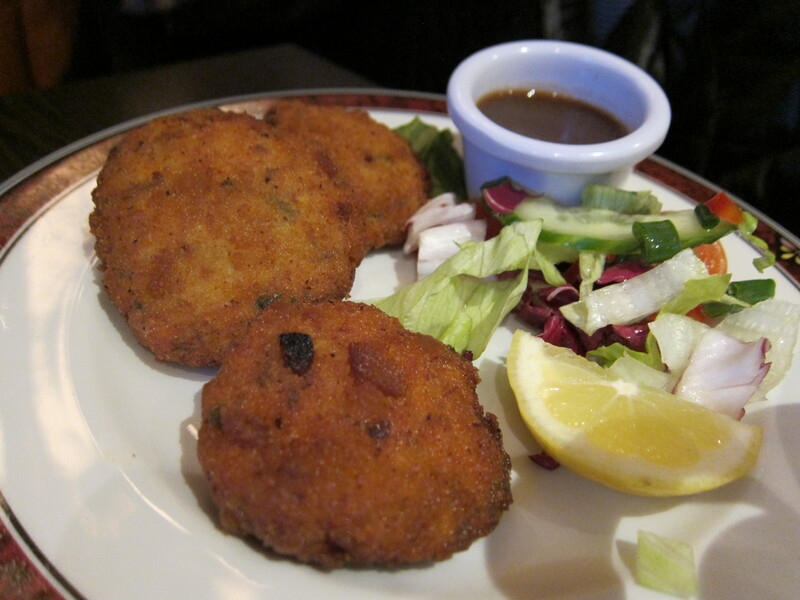 They reminded me more of Thai-style spicy fishcakes I’ve had than Indian ones. The chilli garlic chicken (£5.95) caught my eye and what a flavor bomb this was. The chicken was nicely tender, the peppery, garlicky gravy was divine, even before you hit one of several chunks of garlic to zing things up even more. D.B. 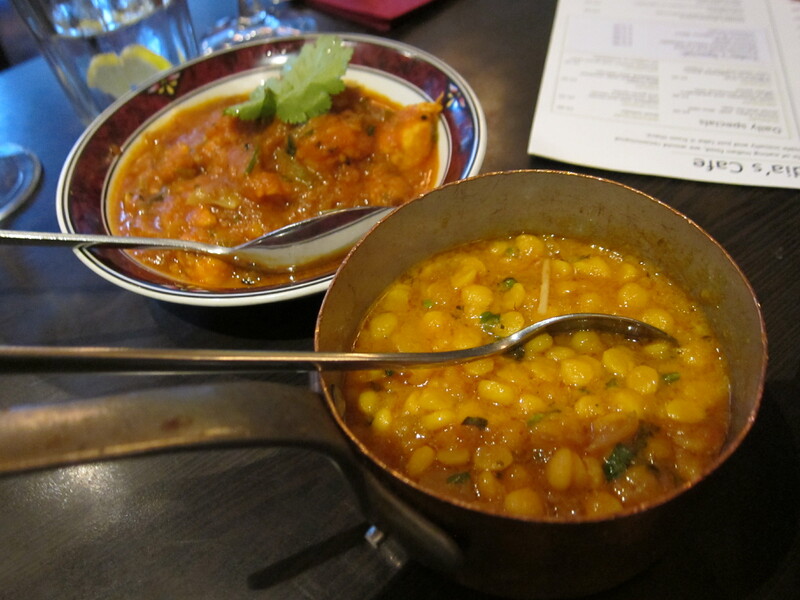 has a soft spot for Mother India’s chana daal (£4.20), which he said he could contentedly eat alone with rice at this restaurant. After a taste, I could see why. The lentils were perfectly cooked — firm yet soft enough, packed with spices and fresh herbs and now and then you’d hit a super tangy, crunchy bit of something that tasted like an intense pickle. Pickled onion or garlic perhaps? That’s what it tasted like to me anyhow. 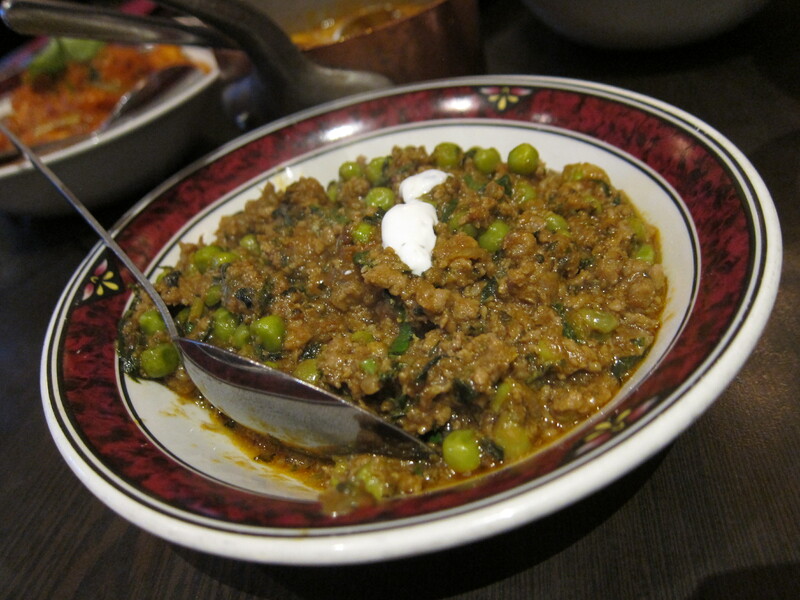 So of course we had to try the keema mutter here (pictured up top). Scotland is the land of lamb, after all. And what deliciousness this was — the lamb itself was incredibly flavorful but the spices loaded in the gravy stood up nicely to the meat. We needed rice to soak everything up, and the lemon cashew rice (£2.75) proved to be a nice, lightly citrusy foil to cut through the heaviness of the spices. And since we’re both massive garlic fans, garlic pitta (£1.95) was a must. Now this was a sheer delight — it arrived so hot out of the oven my fingertips were seared from trying to pinch off a hunk right away. The problem was, I simply couldn’t wait any longer — look at how loaded with garlic bits and oil this was. The smells were overwhelming the moment it hit the table. 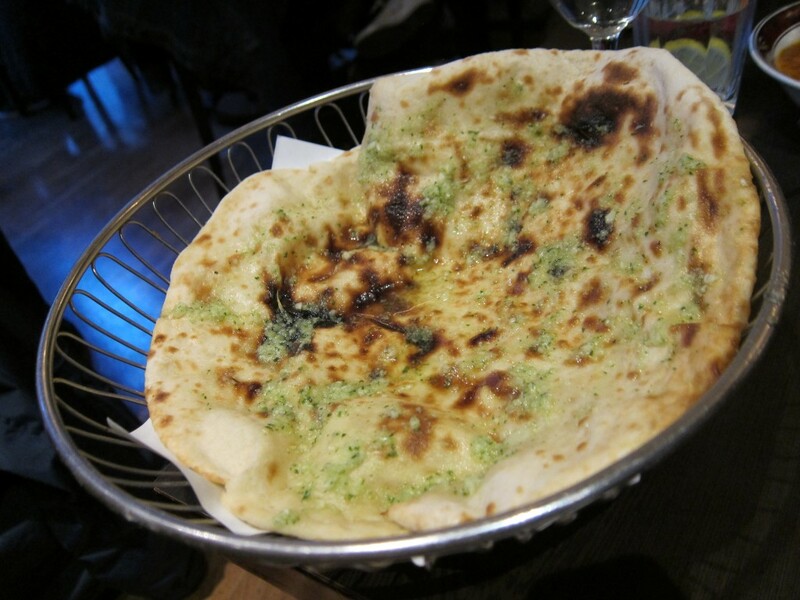 Lovely on its own, this pitta was terrific wrapped around bits of chana daal or keema mutter. The first pitta disappeared so quickly we had to order a second. We had eaten so fast I had assumed there was no room for more. But then this arrived. 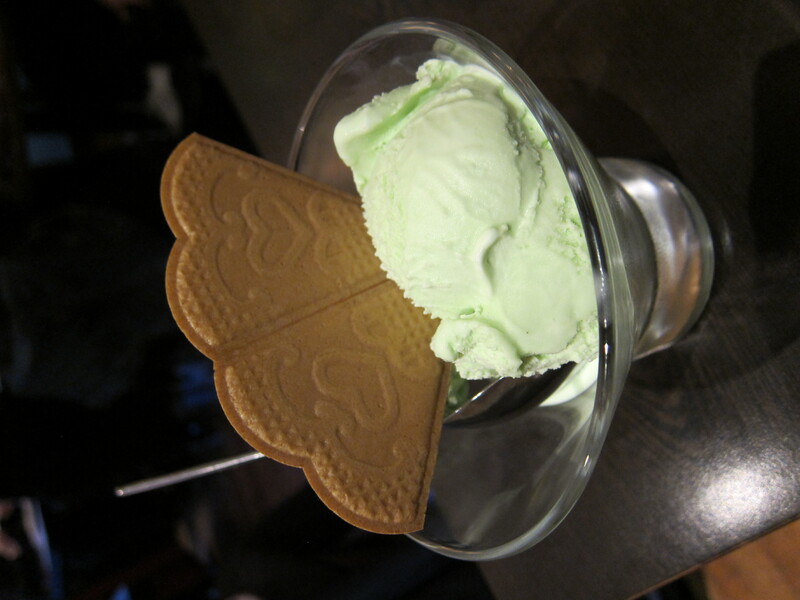 Pistachio (£3.75) seemed appropriate — and what we got was three gigantic scoops. 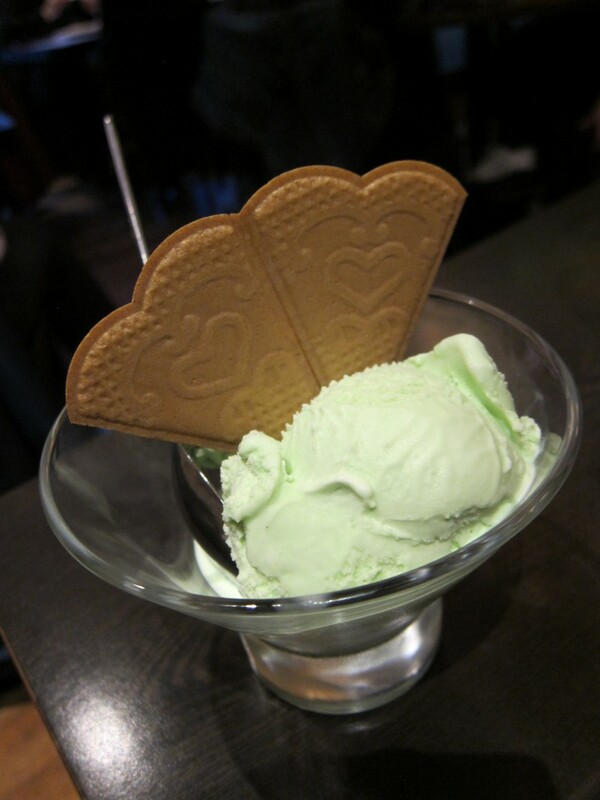 At first, we thought we’d never be able to finish it but the taste of this ice-cream was slightly unusual. 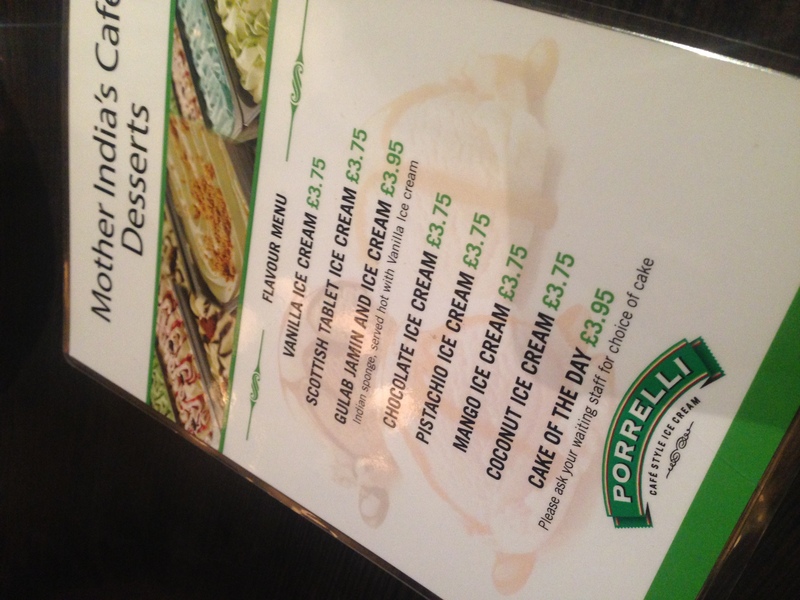 Pistachio was definitely present but so was a lovely layer of something akin to rosewater. When D.B. had first mentioned the outstanding Indian food at Mother India’s, I’d naturally (secretly) scoffed. Sure, it was probably tasty — but I was certain it would pale in comparison to the Indian I’m used to. 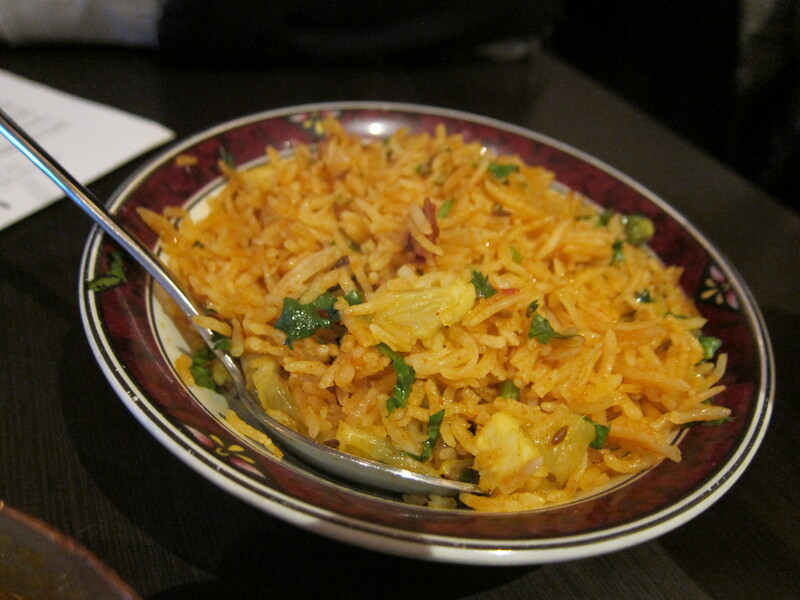 I did grow up in Singapore with one of the world’s best cuisines, after all — a big chunk of which is Indian. 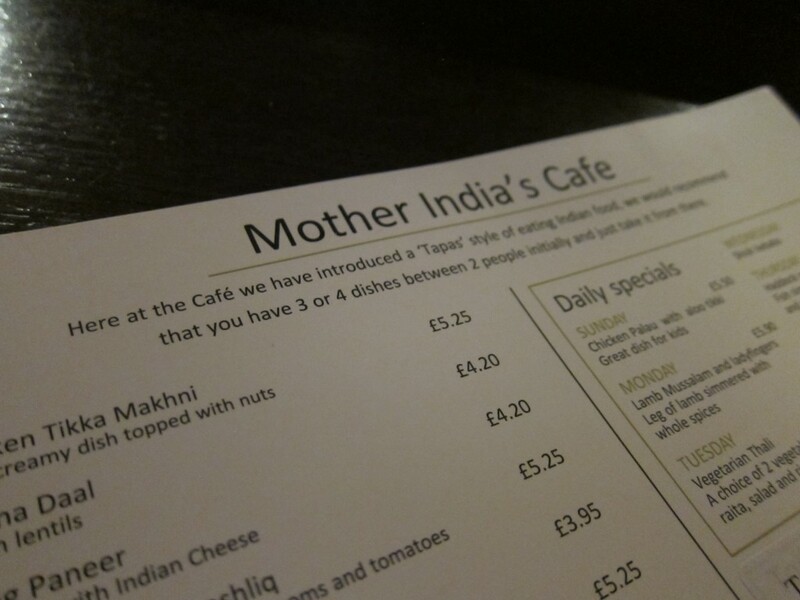 But this food here at Mother India’s Cafe was indeed memorable. And the moment we got up, I was already hungry for my next meal there.